Too many pumpkins? Well we had a lot, maybe too many to eat right away, but it’s never too many to enjoy 🙂 I do have to admit I brought too many sugar pumpkins from the farm, I wish I had gotten another variety, too. I made my velvety Sugar Pumpkin Soup a while ago, but I am finally posting it. At least it is still pumpkin season. This is one thing you can do if you get tired of pumpkin pie. 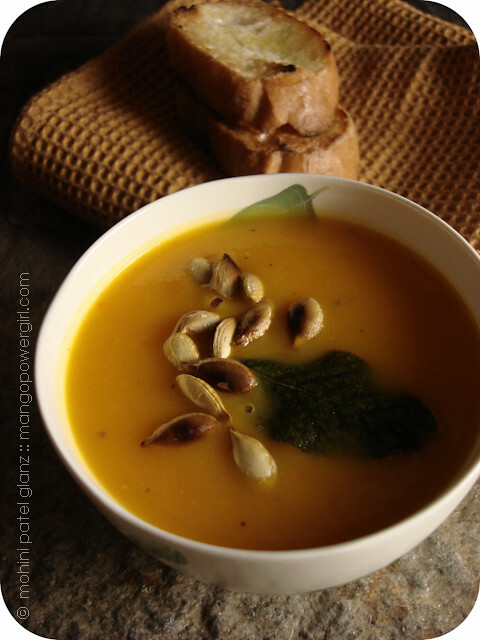 Enjoy some beautiful fall leaves and my Sugar Pumpkin Soup! 1. Sauté leek and garlic in oil over medium heat until translucent. 2. Add carrots, bell pepper, and let them cook till slightly tender. 3. Add the pumpkin, rosemary, marjoram, garam masala, salt & pepper and cook for a few more minutes till the pumpkin softens a bit. 4. Add the water, two cups or just enough to cover the veggies, and turn the heat up to medium high so the mixture comes to a boil. 5. Then turn the heat down to low, and let the whole thing simmer until most of the water has boiled off, and the pumpkin and carrots are totally soft — soft enough to mash it down with your spoon. 6. Take the mixture off the heat and purée it with a hand blender. It should have no lumps. 7. If it is really thick, then add half a cup of water and let it simmer for a couple of minutes, else adjust the salt & pepper and serve. 8. 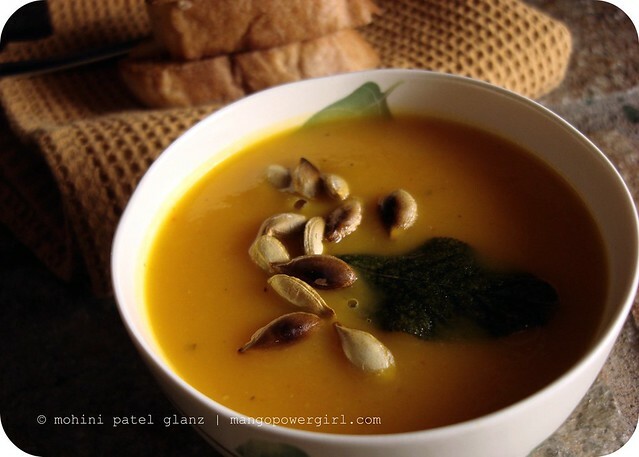 Garnish with a fried sage leaf and some toasted pumpkin seeds, and serve with toasted bread. I’m enjoying your creativity through pictures too MPG! Keep it up! These are stunning. And so is that soup…love the garam masala addition. Perfect for my current eating habits! Beautiful photos, MPG. And the soup looks SO good. Perfect for this time of year. This is a beautiful post, so many lovely photos! A velvety pumpkin soup sounds so tasty! I love Indian spices with pumpkin! Nice recipe! Wow looks yummy. Awesome click of pics. i’ll try it maybe tomorrow…looks great! Thank you all! It was so delicious and comforting, it was gone fast! Mo, who gets tired of pumpkin pie? 😉 Seriously, soup looks delish and your photos are amazing. Just subscribed to your feed so you don’t have to keep reminding me to check out your posts! Hope to see you on the east coast very soon. Peace out! Your pictures are lovely – thank you for sharing. The soup sounds delicious, as well. Here’s to hoping that some sunshine brightens your corner of the world in the very near future …. 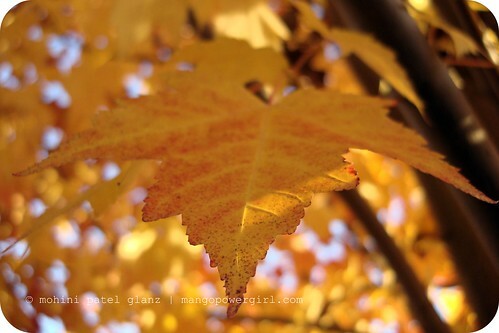 Your pictures are so.. autumnal… So nice to look at. Even much nicer is your soup recipe. Great pictures. I’ve never walked through a pumpkin field.